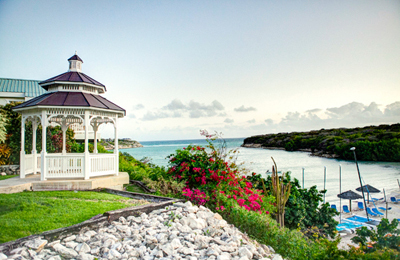 As an eco-friendly luxury resort, The Verandah leaves a gentle footprint on the land so generations to come can enjoy its reef-protected waters and the rugged beauty of nearby Devil's Bridge National Park. Certainly, the dazzling white sand and jewel tones of the Caribbean beckon you to come and stay awhile at this remote eco-sensitive outpost on Antigua's pristine northeast coast—a coastline dotted with protected coves and rugged, scrub-covered cliffs. But there are so many more reasons to make The Verandah Resort & Spa your purposeful respite in the midst of life's hecticness. Its very name evokes restful images of early mornings with a steaming cup of coffee, watching the sun rise; lazy afternoons spent sipping iced tea, maybe catching a cat nap in the shade; and romantic evenings relaxing under the stars, nightcap in hand. The peace and tranquility that permeate The Verandah Resort & Spa are made complete by its secluded setting on 30 acres, overlooking the calm waters of Dian Bay. Could there be a more restorative resort for overworked, underindulged travelers? Ahh, but that's just the beginning. When you step inside your very spacious villa-style suite you'll be drawn to the glistening sea views from its elevated veranda. Cool white interiors are punctuated with hits of emerald-green and apricot, while granite countertops, bamboo and rattan furnishings, and flat-screen TVs are luxurious extras that add to the ambiance of your stay. Because of its remoteness, you might consider choosing the resort's all-inclusive plan, with dining options for both sophisticates and families at Nicole's, Seabreeze, and The Buccaneer. And by all means, wander down to one of two beaches for a bit of kayaking, sailing, or snorkeling. Or unwind beside Antigua's largest free-form swimming pool and let the warm sunshine work its magic on your soul.